Since its appearance nearly 35 years ago,Black's New Testament Commentary Series has been hailed by both scholars and pastors for its insightful interpretations and reliable commentary. Each book in the series includes: an insightful introduction to the important historical, literary, and theological issues; key terms and phrases from the translation highlighted in the commentary where they are discussed; explanations of special Greek or foreign terms; references to important primary and secondary literature; and a Scripture index. ". . . it maintains the high standard of this series. The exposition is lucid, all the main cruces are discussed in detail, and the lengthy, well-structured introduction presents the conclusions which . . . Laws has formed as a result of her detailed study of the text. . . . In Sophie Laws' James, then, we have what will assuredly come to be one of the standard commentaries on this intriguing and delightful letter." "One could hardly fail to be pleased with the content of the work. Laws writes with an engaging style which normally presents her case as clearly as space allows. . . . the challenge of meeting a first-class mind is invigorating. This is not a boring commentary." ". . . not only maintains the high standards of the Black's series but also fares well in comparison with . . . scholarly studies in French and German. . . . The book is a fine example of the well-informed and balanced exegesis which typifies British New Testament scholarship." 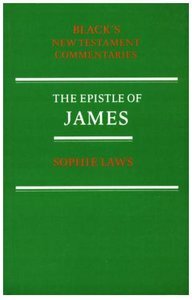 About "The Epistle of James"
This is part of a series of modern commentaries based on new English translations made by their respective editors.While adhering strictly to sound scholarship and doctrine, they intend, above all, to bring out the theological and religious message of the New Testament to the contemporary Church. Eric Laws is at James Cook University, Australia.